The Far North Coast of New South Wales has great weather, stunning beaches and wonderful national and state parks to explore. Visit the North Coast of NSW. Map showing location of Texas, Inverell, Tingha, Guyra, Glen Innes, Lismore, Casino, Ballina, Coffs Harbour, Woolgoolga, Grafton, and the surrounding towns. The beaches, national parks and reserves are stunning, much of it pristine. The fertile hinterlands have great views and beautiful State and National Parks well worth exploring. Be sure to sample the local fare. 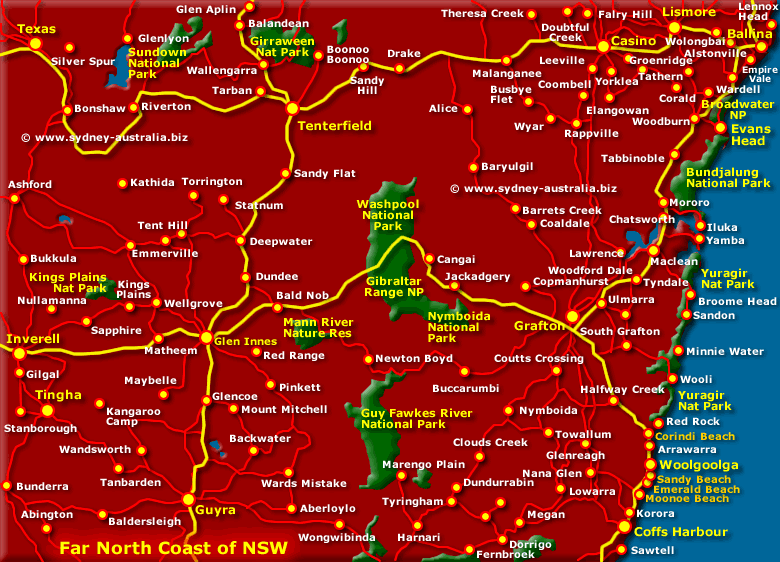 To get to the NSW North Coast - Take the Pacific Highway over the Sydney Harbour Bridge to Highway 1 at Hornsby, then head towards Newcastle and beyond up to the NSW North Coast. You can find all kinds of accommodation along the NSW Coast. For the adventurous who want to explore the wilderness, there are campsites set in stunning national parks. Of course there are hotels, resorts, beach cabins with views, backpackers in convenient locations and caravan parks with facilities for families.